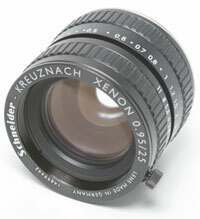 Schneider’s standard C-Mount lenses are used in applications requiring high-quality optics for megapixel cameras. These applications include robotics and machine vision, industrial inspection, document scanning, postal sorting, medical applications, and many others. Our product range includes a large selection of lenses for all purposes. There are lenses available with fixed or variable focal lengths from 4.8mm to 100mm for cameras with 1/2″, 2/3″, and 1″ sensors, with manual or motorized control, and with an extended range of iris adjustment to make use in extreme conditions of illumination possible. Visible Only These C-Mount lenses have been designed to work from 400-700nm. They are high resolution, megapixel lenses with robust mechanical construction. This line includes two Xenon high speed (f/0.95) lenses that have lockable focus and iris functions. The 17mm lens covers an 11mm image circle (2/3” format) while the 25mm lens covers a 16mm image circle (1” format).